I will forever associate this amazing Turtle Cake with birthday celebrations. It used to make an appearance every now and then at the office many years ago, honoring some lucky employee on their special day. But sadly, that tradition ended quite some time ago, and I haven’t had the cake since. I did find the recipe on the website of the cake’s maker, Cafe Latté, however. I printed it out a long time ago, filed it away with all my other recipes to try “some day”, but secretly wondered if I would ever really make it. I was hesitant. I mean, what if my own version wasn’t as wonderful as my memory was recalling? Then, as I was searching for something extra special and super decadent to celebrate my first blogiversary – yep, one year!! – this recipe kept nagging at me from the pile of chocolatey choices. I knew it was the proper moment in time. Time to make a turtle cake! The recipe went off without a hitch and was really rather simple to assemble. I can say the cake was downright FUN to put together! Blake even found me in the kitchen, laughing at the sinfulness I was concocting. And the taste? It was every bit as evil as I remembered. 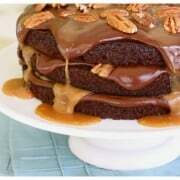 Gorgeously lofty, with three layers of dark chocolate cake, smothered with rich fudgy frosting, creamy caramel, and crispy salted pecans…ooohhhhhhh, baby! Come to Mama! It was the perfect decadence to celebrate my first blogiversary. I’m not in the mood for sentimental and sappy right now. I only wish to revel in the amazingness of the past year. And to THANK YOU for being a part of it. Now, go eat some cake! Preheat oven to 350°. Grease three 9″ round cake pans. Cover each bottom with a disk of parchment paper. Set aside. In a medium bowl, combine egg, oil, and buttermilk. In a separate large bowl, whisk together flour, sugar, cocoa, salt, and baking soda. Gradually add wet ingredients to dry until well mixed. Slowly add the hot coffee. Divide batter evenly into prepared pans. Bake for 25 to 3o minutes, or until toothpick inserted into center comes out clean. Let cakes rest in pans for 10 minutes, then turn out onto wire racks to cool completely. To make frosting, mix milk and sugar in saucepan. Add butter. Bring to boil over medium-high heat. Remove from heat. Add chocolate chips to pan. Using wire whisk, mix until smooth. If frosting is too thick or grainy, add 1 to 2 teaspoons hot coffee. To assemble the cake, place one cooled cake layer, top side down, on a cake plate. Spread with one-third of the frosting, pushing it out gently from edges to make a petal effect. 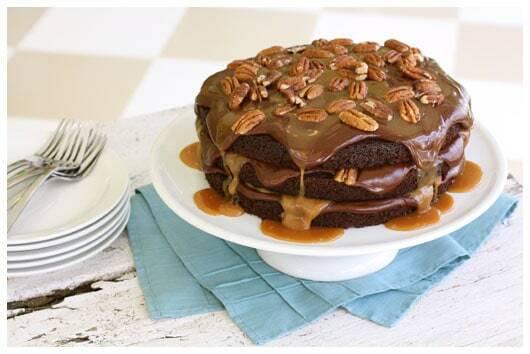 Sprinkle with 1/2 cup pecans, drizzle with 1/4 cup caramel. Add next cake layer, again top side down. 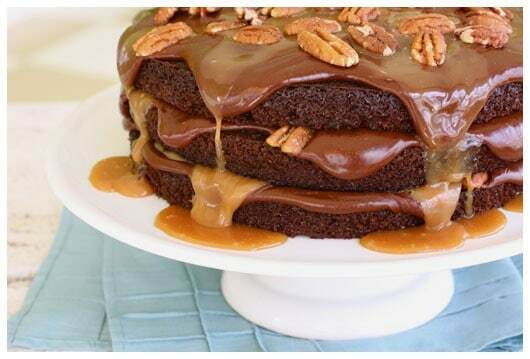 Repeat with the same measurements of frosting, pecans, and caramel. Add final cake layer, top side up, and frost with petal effect and finish with remaining pecans and caramel. I’m connecting this memory evoking cake to “forgotten finds”, a challenge set forth by Amber of Bluebonnets and Brownies and Maggy of Three Many Cooks. Please click on their links to find out more about their desire to actually make all those recipes we’ve snipped, flagged, and saved over the years!